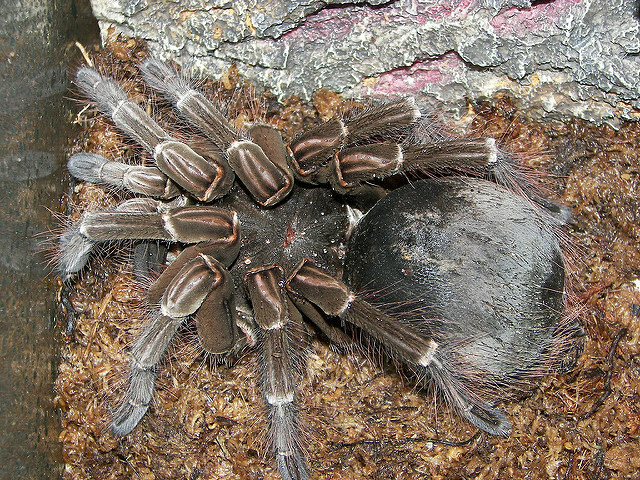 The world's biggest spider weighs as much as a newborn puppy! Spiders hold an undeniably prominent place in the consciousness of the collective psyche. There is no other creature in the animal kingdom that elicits fear quite as intensely as spiders do. Just when you thought these things couldn’t get more terrifying, the world’s biggest spider managed to crawl out of hiding and paralyze the masses with its sheer enormity. The Goliath Birdeater is the world’s biggest spider and it totally lives up to its name. Its name derived from the 18th-century engraving (which subsequently birthed the nomenclature system for the entire theraphosid genus) by Maria Sibylla Merian that depicts a tarantula devouring a hummingbird. Thus, a befitting parallel to the vicious nature of these nocturnal creepy-crawlies. These colossal creatures weigh a whopping six ounces. It does not sound like a whole lot until you realize that it’s equivalent to the weight of a newborn puppy making it the biggest spider in the world (by weight). Also, did we mention that each of its legs is about the size of a child’s forearm? Awwwwww, anybody? These terrestrial arachnids have fascinating abilities that have sparked major interest in the wildlife research community. The Goliath Birdeaters skitter about in the dark, swampy underbelly of South America’s rainforests. They are more specifically found in the rainforests of Suriname, Brazil, and Venezuela. Although dubbed ‘Birdeaters’, these ‘gentle giants’ are rather uninspiring in choosing their prey. They mostly hunt earthworms and other insects but compensate for this with something far more chill-inducing. They attack with their two-inch long fangs. Their fangs apparently have the ability to pierce through a rodent’s skull and shoot a deadly poison. Most remarkable, however, is the Goliath’s complex defence system. It happens in three different ways each solely dependent on the size and lethality of the predator. Initially, they make a peculiar hissing noise similar to the sound of Velcro being pulled. This is their initial attempt to intimidate or scare away predators. If the enemy refuses to go down without a fight, it shoots a cloud of barbed hair at the eyes and mucous membrane which causes immense pain and uncontrollable itching. If all else fails, it uses its handy fangs as a last resort. In addition to these skills, it also has the advantage of tissue regeneration. Even if one of its limbs is lost, it can regrow them. The female Goliath Birdeaters can live up to 25 years, whereas their male counterparts die soon after the 3 to 6-year maturation period. A wildlife enthusiast managed to capture a Guyanese Goliath Birdeater and take it back home. This wildlife enthusiast carried the Guyanese Goliath Birdeater to his lab in Massachusetts and soon after donated it to a museum for safekeeping. Thankfully, the eccentric nature of these spiders has made encounters sporadic and difficult. These spiders also have a cousin, the Giant Huntsman which currently holds the world record for being the biggest in the world by diameter. Their leg-span is an astounding 30-centimetres or roughly the size of a dinner plate. Their bites can be as painful as the Goliath Birdeaters’ despite being comparatively more docile. Previous article 25 Gut-Wrenching Pictures of World War II which prove that war is hell!